Does the Bible say anything about drinking alcohol? Yes, it does, whenever it mentions the consumption of wine or "strong drink." The responsible consumption of wine is encouraged in the Bible. Jesus and the Apostles all took wine to drink at the Last Supper (cf. Mt 26:27,29). Jesus would not have made Himself sacramentally present in wine if wine was prohibited. 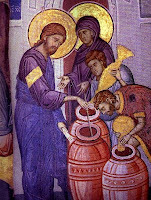 The Son of man came “eating and drinking” (Lk 7:33-34) and one of His final acts on the Cross was to drink the “vinegar” or sour wine that the soldiers offered to Him (cf. Jn 19:28-30). Jesus' first miracle was turning water to wine (cf. Jn 2:1-11), and this after the wedding party had already drunk freely. Paul told Timothy to "use a little wine for the sake of your stomach" (1 Tim 5:23). As for the OT evidence, the prophet Nehemiah commands the people to drink wine (cf. Neh 8:10). The sacrifices that God required often included wine as a drink offering (cf. Exo 29:40; Lev 23:13; Num 15:5,10; 28:7,14). The Psalmist says that God gives man plants so that he may make from them "wine to gladden the heart of man" (Psa 104: 14-15). In Proverbs we receive this counsel: “Give strong drink to him who is perishing, and wine to those in bitter distress” (Prov 31:9). Wine is even used as a symbol of new life and of the fulfillment of God’s promises to mankind (cf. Isa 25:6; Amos 9:14; Zech 10:7). What we should avoid is drinking to the point of drunkenness, or to the point where we no longer have the same control over our actions that we do when we are sober. Isaiah says, “Woe to those who rise early in the morning, that they may run after strong drink, who tarry late into the evening till wine inflames them!” (Isa 5:11). Paul says to the Ephesians, “Do not get drunk with wine, for that is debauchery; but be filled with the Spirit” (Eph 5:18). Likewise, he counsels Titus, “Bid the older women likewise to be reverent in behavior, not to be slanderers or slaves to drink; they are to teach what is good” (Tis 2:3). To the Romans he says, “Let us conduct ourselves becomingly as in the day, not in reveling and drunkenness” (Rom 13:13), and to the Galatians he counts drunkenness as one of the sins that keeps a person from inheriting the kingdom of God (cf. Gal 5:21). As the Catechism tells us, “The virtue of temperance disposes us to avoid every kind of excess: the abuse of food, alcohol, tobacco, or medicine” (no. 2290). I hope that helps. Good Blog! I often wondered if alcohal was as bad as other drugs, many people bring up that it is. I never thought this, but did not know how to argue the point. Alcohal is fine in moderation and does not alter or decieve ones mind as most drugs do. In fact, when they gave him vinegar or "wine" to drink on the Cross, they followed the advice from Proverbs you cited.